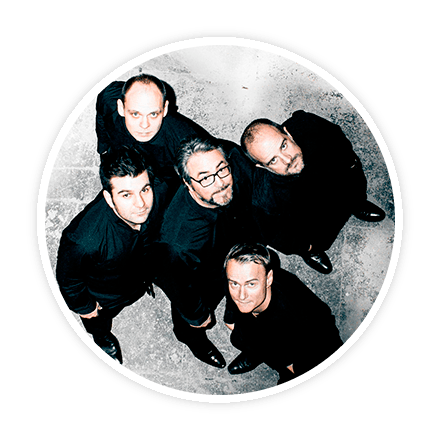 The only "Piano Windtet" of its kind: ensemble 4.1! FOUR wind soloists from top German Orchestras and ONE unmistakable pianist Thomas Hoppe devote themselves to this still undiscovered wonderful musical genre. Ensemble 4.1, "the Easy-Rider of Viennese Classic"
The communicative powers through its music and the intoxicating atmosphere this group creates on stage has repeatedly been praised by critics and has become a hallmark of the ensemble 4.1. In addition to the original masterworks for this instrumentation by Wolfgang Amadeus Mozart and Ludwig van Beethoven, the ensemble is devoted to discovering rarely played compositions from the Romantic and Modern periods. After many years of silence, composers like Walther Gieseking, Theodor Verhey, Herrmann Zilcher and Arne Oldberg are again being performed for an enthusiastic public. The beginnings of the group were overseen and fostered by the renowned Goethe Institute, who assisted with the initial concerts and worldwide tours. Since its inception in 2013, the ensemble 4.1 has already crisscrossed the globe and performed recitals in China, Pakistan, Austria, Germany, Algeria, Canada and the USA, in cities such as Berlin, Istanbul, New York City, Toronto, Ottawa, Karachi, Shanghai and Chengdu. They have appeared with great success at festivals in Denmark and on Malta, as well as at the Kotor Festival in Montenegro.